A new service is now available at the Jones County Sheriff’s Office. 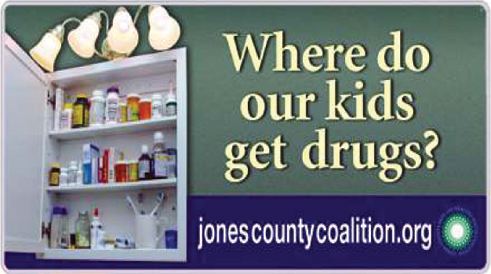 The Jones County Safe and Healthy Youth Coalition purchased a permanent collection box where controlled prescription drugs (painkillers, depressants, and stimulants) are allowed to be disposed of during regular business hours, M-F, 8 a.m. to 4:30 p.m. The collection box is located at the Sheriff’s Office in the basement of the Court House, 500 W. Main in Anamosa. The participating pharmacies of the Iowa Take Away program are still collecting any non-controlled medications during business hours in Jones County as well. Prior to this new service, the best way to properly dispose of controlled prescriptions was to wait for Rx Drug Drives monitored by law enforcement each spring and fall. Anyone with unwanted controlled prescription drugs can now access this disposal service on a regular basis. Also, now the Monticello Police Department collects all medications including controlled substances 24/7. The MPD is localed at 201 E. South St. in Monticello. It is also important to monitor and lock up your medications. Lock boxes are available at our local pharmacies who also participate in the Take Away program–Hartig Drug,The Prescription Shoppe, and The Pharmacy Care Centre.